Let's face it - ruffles are hot. J Crew and just about every other company right now have ruffles everywhere in their catalog. And ruffles are about the easiest thing in the world to emulate as a seamstress. (Hurray for one project that didn't melt my brain!) For example... J Crew currently has their Perfect-fit Cascade Tee selling for $29.50. My version totaled about $10. 1. Wash and iron your t-shirts. Washing first helps keep shrinkage under control and ironing will help give you a more manageable canvas on which to work. 2. Spread one t-shirt flat on a rotary mat and, on the bias, cut strips 2.5-inches wide. Cut the whole shirt. You might not use all the strips, but you might. Better safe than sorry. I used leftover strips to embellish a dance leotard tuxedo-style for my daughter. 3. Cut the end of each strip so that it creates a nice square end. 4. Overlap the ends of two strips and sew with a 0.25-inch seam allowance. (Backstitch if you're worried about the stitches coming loose.) Continue with about three or four strips and stop. Repeat. This should leave you with a couple of sewn strips. 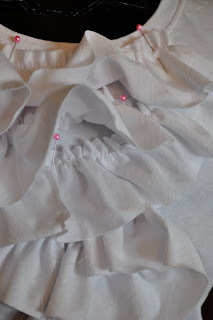 (The ruffle on the shirt s NOT one complete strip, but three.) This will leave the seam allowances exposed. 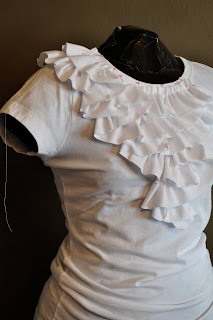 Ruffle shirts are not an exercise in hiding seams, but in embracing elements like fraying, wrinkles, etc. 5. Run a 0.25-inch basting stitch along one side of each sewn strip and gently gather. 6. Stare at the J Crew photo and then begin pinning. The beauty of ruffles is that there is no right or wrong design really. Start at the shoulder and work down, making sure to hide the basting stitch of the layer below slightly. 7. Once pinned, top-stitch over basting stitch. I opted to look a little less like a pirate and ironed my ruffles flat. Did the trick. I'm just scrolling around your five billion blogs here....this shirt is adorable - I'd ask you wear you got it too. Not that I need any more attention drawn to the bosom-age area. Kinda like the infamous puffy shirt but I would agree: not as pirate-y. Me likey. I Truly love this. Super great idea. Beautiful.